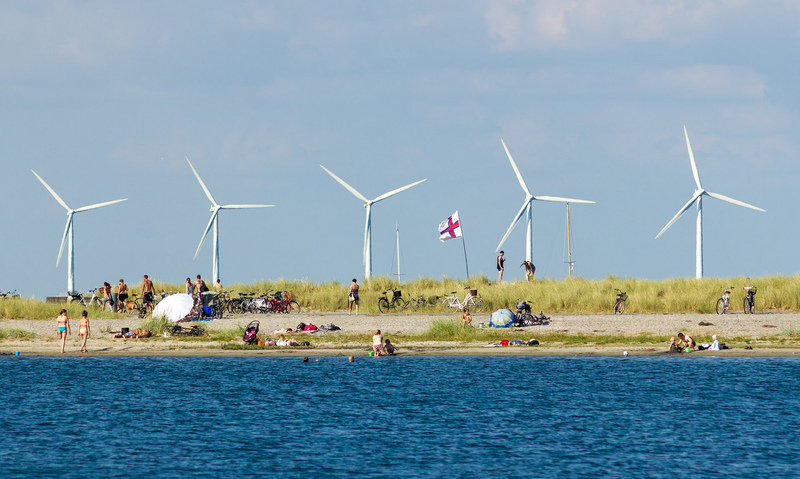 Denmark's Renewable Electricity: How Costly, How Effective? Denmark is a world leader in the development of renewables, but are the Danes getting good bang for the buck as they pay some of the world’s highest rates for electricity? Does the transition to clean power have any traction? Depending on who you ask, Hans Christian Andersen’s home country represents either a bad omen or a guiding light for any government looking at renewable electricity policy. 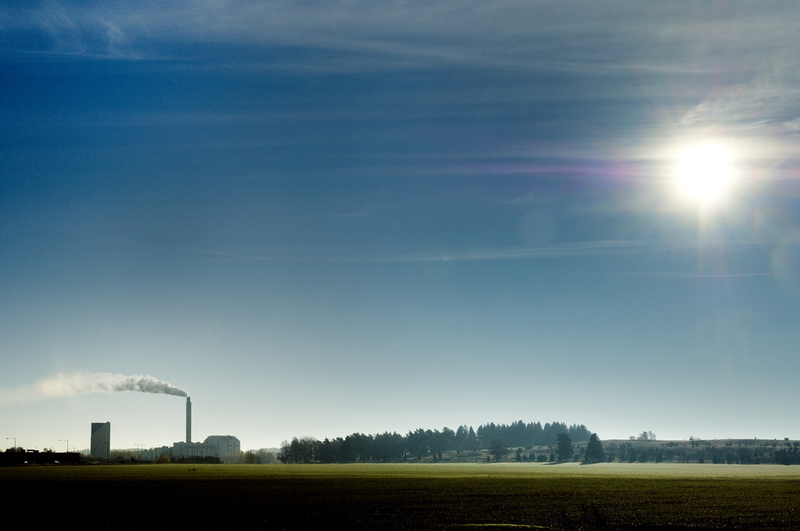 There’s no denying that Denmark is an expensive place to burn power. Further, critics would also contend that despite the expense and massive investments in clean energy, coal is still (2014) responsible for 49% of Denmark’s electric and combined heat and power (CHP) generation. However, in order to exact judgement on the government’s plans, it’s important to take a look under the hood of the renewable power experiment to see if the Danes are getting a good deal. The last 40 years of Denmark’s developing energy policies are steeped in the the 1973 energy crisis. This period of national insecurity prompted an enduring political consensus towards promoting renewable energy and planted the seeds for a national industrial policy aimed at energy self reliance. 25 years after Denmark sunk the first pilings on the world’s first commercial offshore wind farm, Denmark is now one of the world’s top exporters of wind turbines and is on the road to power independence . I won’t go through the details, but understanding the background for Denmark’s energy plans is important. Suffice it to say, the Danes have the most aggressive energy and electricity targets of any country in the world. Let’s get this out of the way. Denmark has the most expensive electricity rates for households in Europe, if not the world. The consumer electricity rate in Denmark is about 50% higher than the European average. By comparison, the average rate for electricity in North America is 0.08 EUR per kWh. However, the story is much different for industry. Industrial consumers in Denmark pay only 0.082 EUR per kWh, far lower than the EU average. Only Denmark’s Scandinavian neighbours beat them on industrial electricity rates. Where’s the electricity going? A recent tally has 33% consumed by households, 33% by service companies, and 27% by industry. Denmark also transmits electricity to its neighbours—after all, the Danish electrical network is highly integrated through physical interchanges and the Nord Pool market—but most often the country is a net importer of power. For now. So, if you’re a household in Denmark, you’re going to pay dearly to burn electrons. Industry, not so much. Denmark has regulated competitive market for electricity. It’s generating costs are actually cheap, surprisingly cheap, and much lower than the European average. So if electricity in Denmark is inexpensive to produce, why the high cost for end users? It has to be some sort of expensive subsidy towards renewables, right? 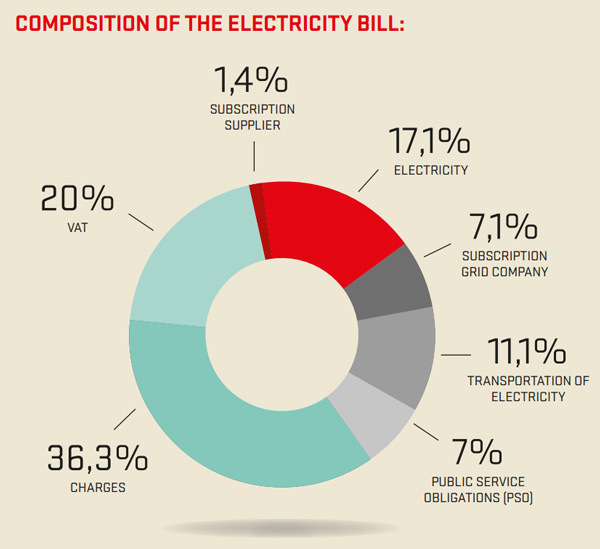 Taxes are actually the primary constituent of Denmark’s electricity costs. 56% of the consumer cost of electricity goes towards taxes that support the Danish welfare state. 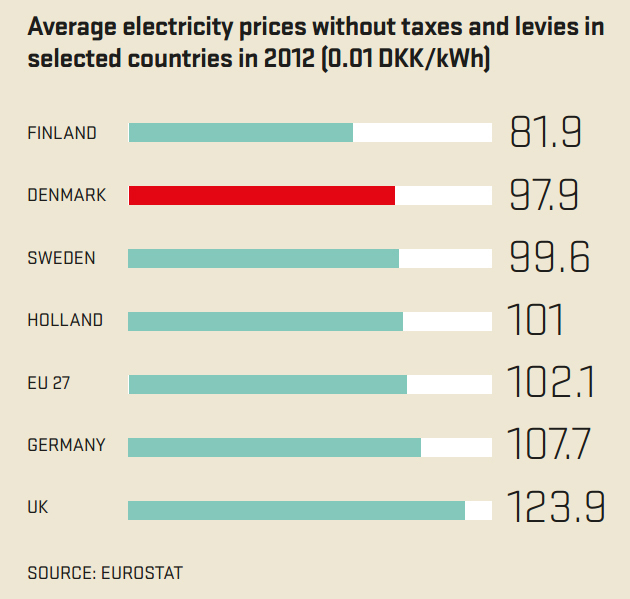 Danes actually pay more in taxes than they do for the production, transmission, and distribution of electricity. However, there is a very narrow wedge of the electricity cost pie that does help fund the energy transition. The levy is called the “Public Service Obligation” (PSO) and it’s responsible for 7% of the end cost of electricity for households and industry. The PSO, which adds about 2.5 Euro cents per kWh of electricity, funds the development of renewable energy, supports decentralized combined heat and power production, and helps pay for energy R&D—In 2012 the levy raised about 630 million Euros in revenue. While energy transition-funding PSO certainly adds to the cost of electricity, it’s definitely not the driver of Denmark’s sky high rates. As mentioned, Denmark began taking serious strides to improve energy efficiency and spur the development of renewables starting in the 1970s. In 2011, the national government released the Energy Strategy 2050, which pledged to move the country’s energy system to 100% renewable energy in just four decades.. Currently, fossil fuels and renewable energy share the load in generating electricity in Denmark. But, is the Energy Strategy effective in promoting renewables? Is the Danish electricity system clean? In 1994, only 4% of Denmark’s electricity was generated by renewables. Now about 50% of the country’s electricity comes from renewable sources like wind, biomass, biogas, etc. That in itself is an incredible achievement, but the shift look even more impressive when you look at the details. On non-renewables: Coal generation has been cut by nearly 70% in just 18 years. It’s expected that coal will fall from providing about half of Denmark’s electricity today to just 7% by 2024. Remember, the goal is to completely phase out coal generation by 2030. On renewables: Wind and biomass electricity generation grew at a rate of nearly 50% annual between 1994 and 2012; that means that power from these sources doubled nearly every two years. Solar generation wasn’t even tracked in 1994. 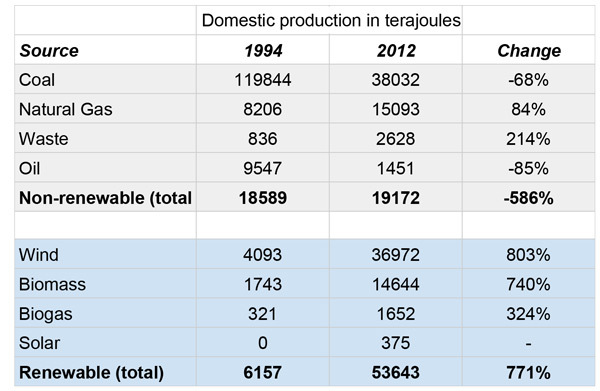 It went from effectively nothing, 22 terajoules in domestic production in 2010, to 375 terajoules in 2012. In itself, that’s not much electricity, but the rate of growth is exponential and tracks other global trends in solar photovoltaics. The data shows a death knell sounding for coal while renewables are scaling up at an incredible rate. Electricity use in Denmark has essentially risen with population growth over the past three decades. Between 1990 and 2012, total consumption grew 8.6%. 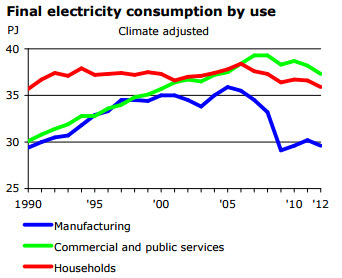 However, a remarkable thing happened in around 2006: Electricity use peaked and has since began to decline. With total household consumption now at the same level as it was 25 years ago, it appears as if those ultra-high rates are encouraging energy savings and efficiency upgrades. How environmentally efficient is electricity generation? I touched on the fact that nearly half of Denmark’s electricity comes from coal plants, one of the dirtiest forms of power generation—though not all coal plants are created equally. Denmark also generates not an insubstantial amount of its electricity from natural gas (~8%), which is a step up from coal, but still a large source of emissions. Still, despite the current dependence on coal and to a lesser extent natural gas, the Danes’ electricity system is very clean by most standards. 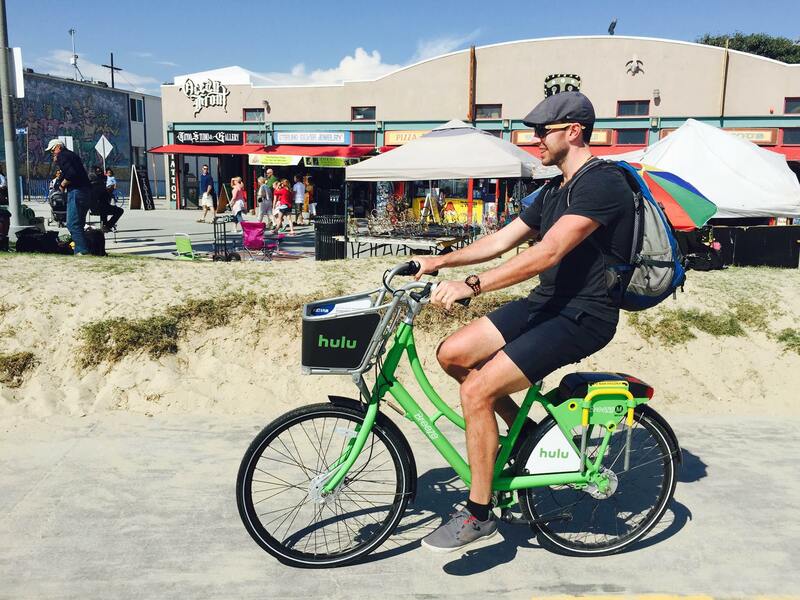 In 2014, it generated 401 grams of CO2 emissions for every kilowatt-hour of electricity used. This is the average rate for all sources consumed in the country: coal, gas, oil, biomass, CHP, wind, solar, etc. While the Danish electricity system isn’t as clean as Canada’s or Sweden’s, which are two hydro-superpowers, it’s about average for Europe. Without any hydro or nuclear generation to speak of, Denmark’s electrical generation system is very tidy as a greenhouse gas emitter. Even better, the Danish electricity sector blows both the US (610 Grams/kWh) and Australian (885 grams/kWh) power sectors away in terms of environmental efficiency (or at least the climate dimension of environmental efficiency). Denmark is an expensive place for households to use electricity and the country still uses coal, a lot of coal. But it’s clear that the Danes are currently undergoing a rapid energy system transformation. It appears that electricity consumers are bearing a slight brunt of the Energy Strategy’s costs, but the lion’s share of Denmark’s high electricity prices can be attributed to taxes not specific to energy policy. Despite its current energy mix, Denmark’s electricity system is relatively clean and only getting cleaner. Next ArticleWhich Canadian provinces have a renewable portfolio standard?